Josep Guardiola, one of the most important players in Barcelona’s history, took over as first team manager on 17 June 2008 after a brilliant season as coach of Barça Atlètic with whom he won promotion to Second Division B. “I can’t promise you silverware, but I can say that we’ll keep on battling to the end and you’ll be proud of us,” he said on the day of his first Gamper Trophy. And he was right. The fifteenth Catalan manager in the history of the club arrived with the mission to end a two-season long trophy drought. To do that he used the same 4-3-3 system he had experienced as a Barça player and which had brought him success at Barça Atlètic. Pep Guardiola and assistant coach Tito Vilanova's team only understood one way of playing football which is to attack, keep possession and move the ball around so that the other team has to run after it. That’s the way his Barça side played, as did his Barça Atlètic, and they had more possession and more shots on goal than virtually every team they played. He appreciated the talent of his players but he put hard work and individual sacrifice for the common cause first. He saw football as a team sport in which he has ultimate responsibility for results and was therefore also the leader of the squad. 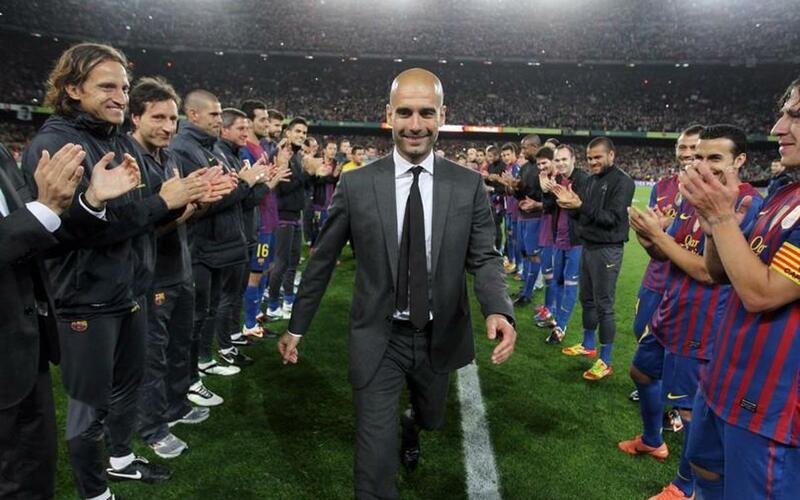 Josep Guardiola was a meticulous manager who saw to the tiniest of details. He got ready for every game with videos of the opposition and never thinks beyond the next match. He was a brilliant motivator who brought the best out of each player in his squad. This philosophy of football led to his success as first team boss, when the team had their best year in the history of the Club winning the Spanish League and Copa double, the Champions League, both the European and Spanish Super Cups and the Club World Cup in the year of the six titles. This excellent campaign means that Guardiola was the third manager after Cruyff and Samitier to pick up the league title as coach after having won it as a player at Barça. He became the sixth man to win the Champions League as a manager having previously done so as a player, and the first manager to win the treble in the 21st century and the first ever to win six titles in a single year. In the 2009/10 season, Guardiola’s second in charge, the Liga title was won for the second year in a row, and the twentieth on club history, setting a new record of 99 points in the process. The title was not decided until the very last day, with a 4-0 win against Valladolid at Camp Nou, Barça claiming the league title at home for the first time in front of their own fans since 1993/94. The avalanche of titles did not stop there. In 2010/11 the team won the Spanish Super Cup, the league and the Champions League. The following campaign they won the Spanish Super Cup, the UEFA Super Cup, the Club World Cup and the Copa del Rey. In the final of the latter, the last game with Guardiola in charge, the team produced an opening half hour in the 3-0 win over Athletic Club that many consider to be amongst the finest passages of football played by Pep’s Barça side. During Guardiola’s time, Barça did not just triumph, they collected records and trophies like other collect stamps. In those four years they broke more than 40 national, European and World footballing records and won 14 out of a possible 19 trophies, an unprecedented achievement in footballing history. Among the trophies he won at Barça are six leagues (1990-91, 91-92, 92-93, 93-94, 97-98 and 98-99), a European Cup (91-92), a Cup Winners’ Cup (96-97) and two Copa del Rey (96-97 and 97-98) before his departure at the end of the 2000-2001 season. In Italy’s Serie A he made his debut with Brescia in the 2001-02 season, followed by a year with Roma before going back to Lombardy. Later on he went further afield to Al-Ahly in Qatar for two seasons (2003-04 and 2004-05) and Dorados de Sinaloa (Mexico), where he hung up his boots for the final time in 2006.